Just how diligent was Intel's due diligence when it chose to build a multibillion-dollar chip plant in Qiryat Gat, Israel? Will choosing that location eventually come back to haunt the company, or at least drag it into some pesky, embarrassing and costly legal entanglements? These questions are on my mind after checking out the history of the site -- not only on several Web sites dedicated to the Palestinian cause, but also in Israeli government and United Nations documents collected by a prominent Israeli historian. Whatever your views on the Middle East crisis, the issue deserves some scrutiny -- even though it involves a detour into what many now consider ancient history. 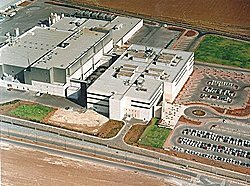 Intel calls the plant Fab 18 ("fab" being chip-industry jargon for a facility where the silicon wafers that are eventually turned into working chips are fabricated). The fab, which went into production in 1999, was the fruit of a $1 billion investment by the Santa Clara company, supplemented by a $600 million grant from the Israeli government. Just a year after opening, its output had reached up to $3 million a day, and it accounted for $1.3 billion of Intel's $2 billion in exports from Israel. According to the company's annual report, it's Intel's second-largest facility outside the United States, after one in County Kildare, Ireland. 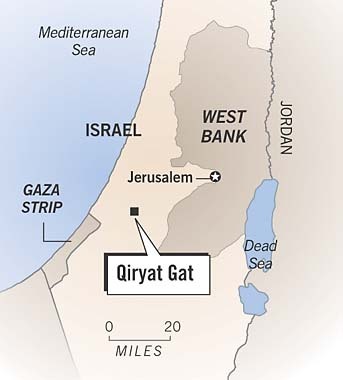 Qiryat (sometimes spelled Kiryat) Gat is close to the geographical center of Israel, along a major north-south rail line and the route of the planned Trans-Israel Highway. It's on land that would have been part of Arab Palestine under the partition plan adopted by the United Nations in 1947, but within the larger Israel that emerged from the 1948 war between that country and its neighbors. In other words, it's on land the United States and most of the world's governments consider a legitimate part of Israel, not in the territories Israel conquered in the 1967 war, from which the United Nations has demanded its withdrawal. The area was surrounded by Israeli forces, however. 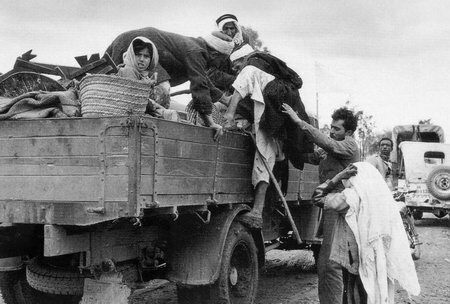 When Israel and Egypt signed an armistice agreement in February 1949, the latter agreed to withdraw its soldiers, but it insisted that the agreement explicitly guarantee the safety and property of the 3,100 or so Arab civilians in the area. Israel accepted that demand. In an exchange of letters that were filed with the United Nations and became an annex to the main armistice agreement, the two countries agreed that "those of the civilian population who may wish to remain in Al-Faluja and Iraq al Manshiya (the two villages within the enclave covered by the letters) are to be permitted to do so. . . . All of these civilians shall be fully secure in their persons, abodes, property and personal effects." Morris presents ample evidence that the people of the Al-Faluja area left in response to a campaign of intimidation conducted by the Israeli military. He quotes, among other sources, reports filed by Ralph Bunche, the distinguished black American educator and diplomat who was serving as chief U. N. mediator in the region. Bunche's reports include complaints from U.N. observers on the scene that "Arab civilians . . . at Al-Faluja have been beaten and robbed by Israeli soldiers," that there were attempted rapes and that the Israelis were "firing promiscuously" on the Arab population. Even though Bunche won the Nobel Peace Prize in 1950 for his efforts, some might be inclined to doubt that he understood the whole story of what was happening in the area. But even the staunchest supporter of Israel would have a hard time impugning Morris' other main source on this episode: Moshe Sharett, Israel's foreign minister at the time. Sharett, it turns out, was acutely embarrassed by the behavior of his country's military in the area. In a sharply worded memo to the army chief of staff, he noted both overt acts of violence by soldiers in the area and "a 'whispering propaganda campaign among the Arabs, threatening them with attacks and acts of vengeance by the army." "There is no doubt," Sharett wrote, "that there is a calculated action aimed at increasing the number of those (Arab civilians) going to the Hebron Hills (in the West Bank, then controlled by Jordan) as if of their own free will, and, if possible, to bring about the evacuation of the whole civilian population" of the pocket. Sharett's main concern, it appears, was that the campaign in Al-Faluja called into question "our sincerity as a party to an international agreement." Whether he had any moral scruples about the situation isn't clear. 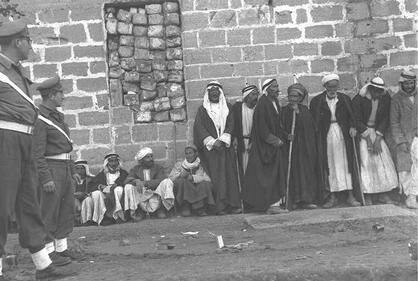 A few months later, when Arab civilians in other parts of Israel's newly conquered territory resisted similar pressures, he wrote, with what sounds like regret, "It is not possible in every place to arrange what some of our boys engineered in Faluja (where) they chased away the Arabs after we signed an . . . international commitment." Nowadays we'd call the Al-Faluja events ethnic cleansing. In substance, what happened to the people of Al-Faluja and Iraq al Manshiya isn't very different from what happened to the residents of hundreds of other Palestinian villages. 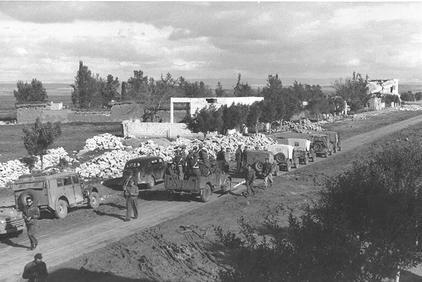 Only a few things make this case unique: the legal agreement that was supposed to guarantee the residents' security, the Sharett memos recording what happened to that guarantee -- and the fact that 40 years later their land, having been converted by the Israelis into an industrial park, became the site of an Intel fab. Now Palestinians in the United States and elsewhere are starting to organize around this case. A Connecticut organization called the Palestine Right to Return Coalition (www.Al-Awda.org) is encouraging Palestinians and their supporters to write to the media about the case. (A version of the story appeared earlier, in somewhat garbled form, in The Register, a British Web site covering technology). The group is calling on Intel to, among other things, divest from Israel. It's also tracking down the original Arab villagers and their descendants -- now almost 15,000 people in all, including people living in Texas, Louisiana and New York. While the group hasn't announced any plans for legal action, some Palestinian lawyers are looking for ways to pursue their cause in the courts. At least some experts think the residents of Al-Faluja and Iraq al Manshiya could make a strong case. For example, Francis Boyle, a professor of international law at the University of Illinois at Urbana-Champaign, said he wasn't familiar with the details of the situation. But based on my summary of the history, he said that the original inhabitants and their heirs could take Intel to a U.S. court in a type of suit known as an in rem proceeding or under similar doctrines in many other countries and seek to attach Fab 18's assets. "Intel and its lawyers and bankers had better be very careful here," he said, noting that a similar legal strategy was used in cases involving the former British colony of Rhodesia -- and by Jewish survivors of the Holocaust. Boyle is a longtime supporter of the Palestinian cause, so I talked to a lawyer at the opposite end of the political spectrum: Abraham Sofaer, George P.
Shultz Distinguished Scholar and Senior Fellow at the Hoover Institution at Stanford University, a former federal judge who served as legal adviser to the State Department from 1985 to 1990. Not surprisingly, Sofaer was less sanguine about the prospects for any such lawsuit, but he also said he wasn't familiar with the facts of the case. The main obstacle, he said, is the absence of a treaty resolving the conflict between the Israelis and the Palestinians and legal structures for settling property claims. "Without that," Sofaer said, "the courts are going to be very reluctant to get involved" in such cases. But if peace ever comes, he said, "I'd be very happy to represent the Palestinians." Noting that native Americans won compensation in several major cases once Congress adopted procedures for dealing with such claims, he said, "It sounds as if there's potential in the long run for recovery here." Several weeks ago, I asked Intel spokesman Chuck Mulloy about the history of the land where Fab 18 sits. He said the company had acquired rights to it in a deal that was legal under the laws of a recognized sovereign state. "We don't think it's appropriate for us now to question the Israeli government. "We cannot insert ourselves into the middle of what is really a political issue" between Israel and the Palestinians, he said. Those arguments are understandable, though I'm sure they won't placate the Palestinians, and I wonder how they'll stand up if the case ever gets to court. Mulloy also said the fab is not actually in the area that made up the Al- Faluja pocket in 1948. "These claims didn't come up until after we built the fab -- there were no Web sites and no campaigns about it when we did our due diligence" in the mid-1990s, he said. When I went back to my sources, those arguments didn't check out. The maps I examined seem to confirm the Palestinians' claim that Fab 18 is on land that was part of the village of Iraq al Manshiya. As for when the issue arose, I checked and found that Morris' book was first published in 1987 and widely debated in Israel. I left Mulloy several follow-up messages reporting what I'd found, but he didn't respond. I also called the Israeli consulate in San Francisco to get its perspective, but the first official I spoke to there said he didn't believe the story, and the press spokesman he referred me to hasn't called back.